we can definitely awesome. | sara, darling. i very much like it when nouns become verbs. i have no logical reasoning why. and this is really, really nerdy. and not in the way that all the popular beautiful celebrity-like people say how they are such “dorks” these days, or were “nerds” in high school. no, i knew the nerds in high school. and you, beautiful person, were not one of them. no, i mean that this is actually, awfully nerdy. the kind that makes me feel like that one girl in my lit class who talks; everyone cringes. the same girl who wanted to dress up in a hawaiian shirt and give out candy for the focal point of her senior-level oral presentation on hunter s. thompson. cringe. 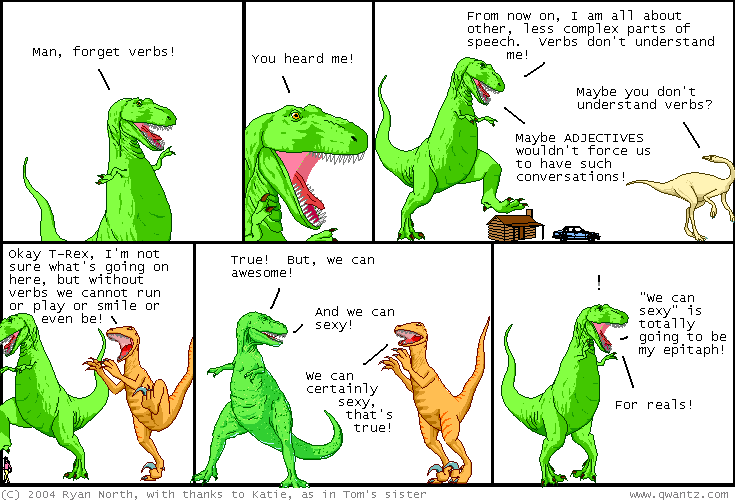 liking this odd grammatical development reminds me of this cartoon that my delightful friend kinsey showed me ages and ages ago, when she was still as fantastic [and nimble, as it were] as she is today. but sans amazing band. this cartoon strip is created everyday, with the same exact images, but different words. to this day, it is one of my favorite things.